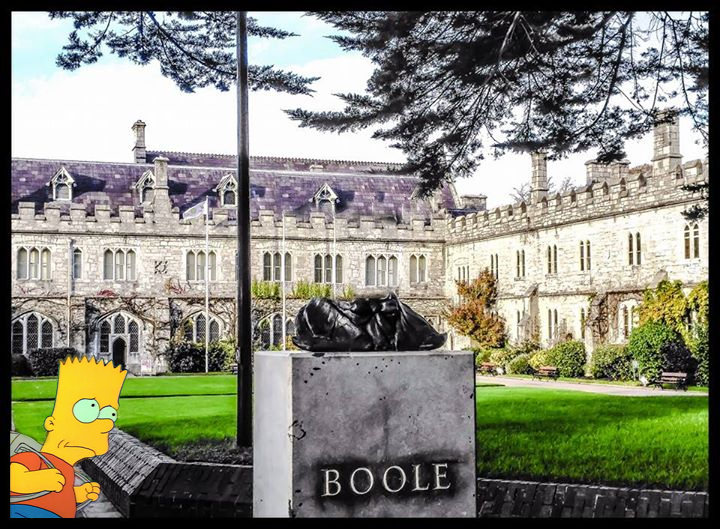 A statue of legendary mathematician & tourist attraction George Boole was today unveiled by staff of UCC. The statue, which has been covered in its place in front of the Boole Library for several weeks, was revealed to applause from a collection of students of the college, visitors and staff members. Sadly, UCC Express has the unfortunate responsibility to announce that the statue has been vandalised by an unknown criminal element on campus. UCC Express’ expert photographer was able to get a snapshot of the believed suspect. Described as a jaundiced bandit, the suspect goes by the alias ‘El Barto.’ It is unknown why the suspect did this to the statue, but we can speculate that it is to fund a fabulous extravagant lifestyle. Or pay for food.